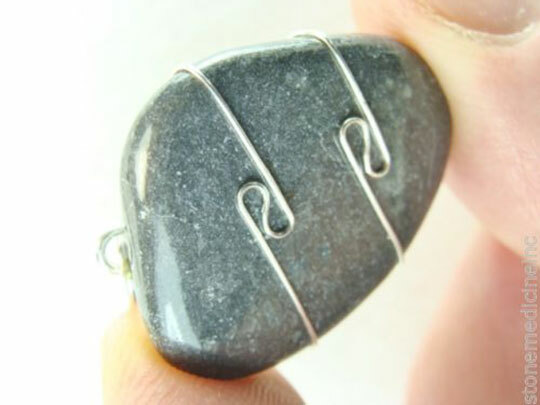 Black Calcite Birthstone, Lucky stone according to your Birthday. Black Calcite is mined in the United States, Peru, Brazil, Iceland, Romania, Slovakia, the Czech Republic, Belgium and the United Kingdom. However, in 2005 a rare variety of Black Calcite was discovered on a privately owned property in the Rocky Mountains of Colorado. This unique variety of Black Calcite is known under the tradename of Shamanite and has been certified by the Gemological Institute of America. Shamanite has a high content of Carbon with traces of Quartz, Pyrite, Marcasite, Chlorite, Strontianite, Zircon and micro-fossils. This stone tends to be confused with Jet, which looks the same but is geologically another rock that vibrates different metaphysical energies. Shamanite has been used for centuries by the Native American mountain tribes to create ceremonial artifacts, amulets and jewelry. The tribal shamans call this stone "Toho" (which literally means 'Mountain Lion'). The Native Americans call the Cougar "Mountain Lion". Shamanite vibrates the energies of the Cougar totem and is used in meditation to invoke a telepathic connection with this totem animal spirit guide. The Native American Cougar totem makes us aware of the importance of using our personal power for the highest good of all. Moreover, this animal totem teaches us that in order to lead others we need to set a personal example and walk our talk. Like all black stones, Black Calcite is a grounding and protective stone. Furthermore, Black Calcite can be used to cleanse the aura from all forms of negativity. This stone absorbs the negative energies and transmutes them into beneficial healing energies. It is also used as a metaphysical shield against psychic attacks, ill wishing, black magic and the Evil Eye. Black Calcite is the lucky stone for historians, archeologists and past life therapists. Meditating or sleeping with a piece of Black Calcite can awaken memories from past lives in order to help us face and release unresolved issues that accompany us in this life. Healers and psychics can use Black Calcite for shamanic journeying and vision quests. The stone's vibrations enhance the power of clairvoyance and help to induce lucid dreaming. Wearing or carrying a Black Calcite is especially helpful for healing all forms of depression, phobias and psychological imbalances. If someone you care about has suffered a bereavement, a loss of job or had their heart broken by unfulfilled love, give them a piece of Black Calcite as a personal talisman for turning grief into new hope. As the saying goes: What doesn't break you makes you stronger and wiser. You should allow for your own weakness and vulnerability. Avoid being blunt and take time to explain yourself. Don’t be so hard on yourself and those near and dear to you today. Don’t give up your spontaneity for the sake of success. Let sorrows and burdens go. Planning too much for the future can inhabit the natural flow of events. Fulfill the opportunities you have been given by living up to your potential. Remember that the easiest way is not always the best. Remember that not everything in life can be designated or formulated.